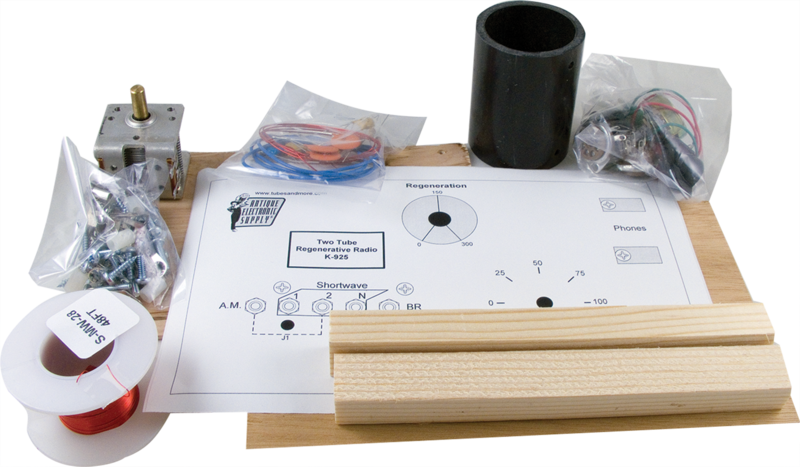 This radio kit will cover the AM radio band along with the SW radio band. Power for this receiver is 1.5 V DC for the filaments and 45V DC for the plate current. A D cell and five 9V transistor batteries wired in series will work to power this radio. A 2000 ohm headset or an audio amplifier is required. Requires two T-1T4_DF91 tubes (not included). Packaging Dimensions 8.6 in. x 7.8 in. x 3 in. This was a fun kit to build... a couple of notes to really make this kit sing... you need a long wire... like 75 to 100 feet to hear the short wave bands. Also, these are battery tubes... so don't expect that orange glow... you can see it if you strain your eyes in a dark room, but don't expect that glow to double as a night light. I did add a couple of improvements to make tuning easier: I added a Philmore vernier dial to the tuning capacitor to reduce the speed of tuning - these can be very expensive - almost half the cost of the radio, but we'll worth it! I will also be replacing the 50 ohm regen control pot with a 10-turn 100 ohm potentiometer. Also kind of expensive, but it makes tuning a lot easier. Another thing about battery tubes... you don't have to wait for them to warm up... they started working instantly like transistors. The wooden chassis and front plate are very poor quality. They are no where near rectangular and the cut is extremely rough. As for the construction, it is not too difficult and goes together rather easily. I was disappointed with the sensitivity of the completed product. I built a similar two tube (also 1t4's) radio when I was about 10 or 12 years old that had much better sensitivity. This was to be a nostalgic return to my childhood, but found it quite disappointing. Fine kit but there is missing an alligator clip. Asked by Anonymous on August 20th, 2016. This radio kit will cover the AM radio band along with the SW radio band. Does it cover the 80 Meter [3.5-4 MHz] and 40 [7.0-7.3 MHz] Meter Ham Bands?? Difficult to tell. I built the kit but there's no way to determine the frequency you are on. I just know that one setting is for the AM band, and the others are for shortwave. I'm sure it covers at least the 5-10mhz portion of the SW bands. We can not offer suggestions on additional modifications for this kit. We recommend you consult a qualified tech for additional information. The K-101A kit sold here. For some reason it's listed under radio and antique parts.It used to be called A,B and C Battery Eliminator kit. It works great. It's now called pine board power supply. Asked by Anonymous on February 21st, 2016. Asked by Anonymous on May 19th, 2016. Unfortunately we don't have any photos of the completed kit but I did find that by searching "antique electronic supply tube regenerative radio kit" that I was able to find a few images that give you an idea of what it will look like. Asked by sterling.lombard@gmail.com on July 16th, 2016. Please give us a call at: 480-820-5411. Asked by twowindsbear on February 4th, 2018. Unfortunately we do not know if this would work. You might want to contact Bob at heilsound.com for more information. Asked by Anonymous on March 28th, 2018. K-934 and K-935 are items we do not carry. If you are having trouble reading your instructions please email customer service at: custservice@tubesandmore.com. Asked by Anonymous on January 24th, 2017.